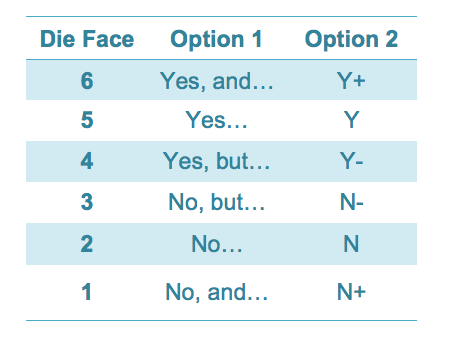 FU uses dice to generate a response to a closed question, with Yes, No, And, But providing six distinct possibilities for resolution. While these results can be generated with a standard six-sided die, sometimes it is fun to have something a little more custom. 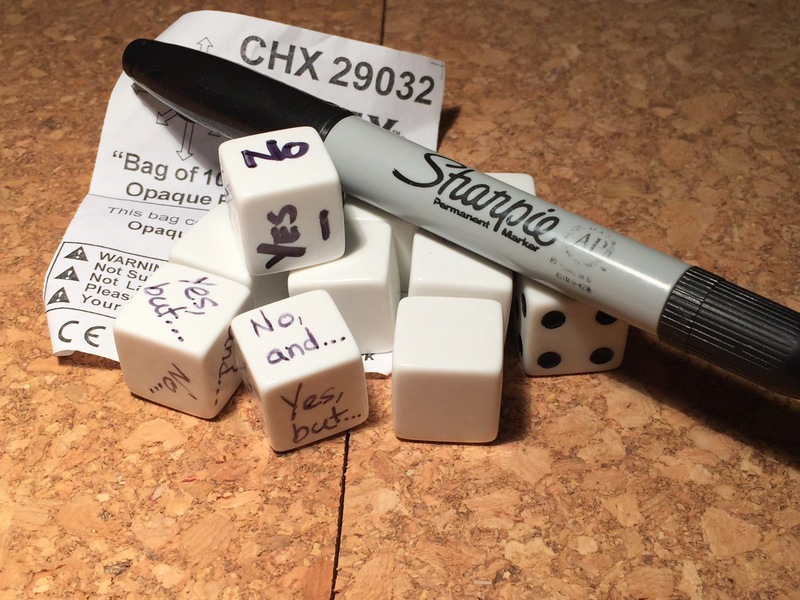 In my Them Bones article I shared some commercially available custom dice, but today I thought I would share two quick ways to make your own custom dice for games of FU. I’ve had a couple of packets of Chessex blank dice floating around for years. As a game designer I am always collecting odds and ends to build prototypes and picked these up some place long ago, but you can still get them here. I simply wrote the possible results on each face of the die using a Sharpie. Depending on how steady your hand is and how fine the marker, you may get a simple symbol (“Y” or “Y+”), or the whole phrase (“Yes, and…”). I quite like the ultra fine Sharpie as I was able to fit the whole phrase on each side of the die. I used a standard D6 as reference so I knew where to write each result. For these dice I did not use the evens / odds of the “Beat the Odds” chart, but simply made higher results better than lower results. I love this suggestion from Dave over at Minifig Melee. Lego dice, available in the Lego boardgames, have rubber edges making them quite bouncy and somewhat unpredictable! They are also large, which makes it satisfying to hold in the hand, though you probably couldn’t hold more than half a dozen. I used colour Lego pieces for each face of the die, green for “Yes” and grey for “No”. I then used a secondary colour to represent And/But results – in this instance white for “And” and red for “But”. Have you made your own custom dice for FU? Or are you happy with the standard D6? What do you think about the classic “beat the odds” roll where even numbers are good and odd numbers are bad? After writing on the blanks w/ Sharpie, it may be worth hitting them with a layer of clear-coat to keep the marks from wearing off. 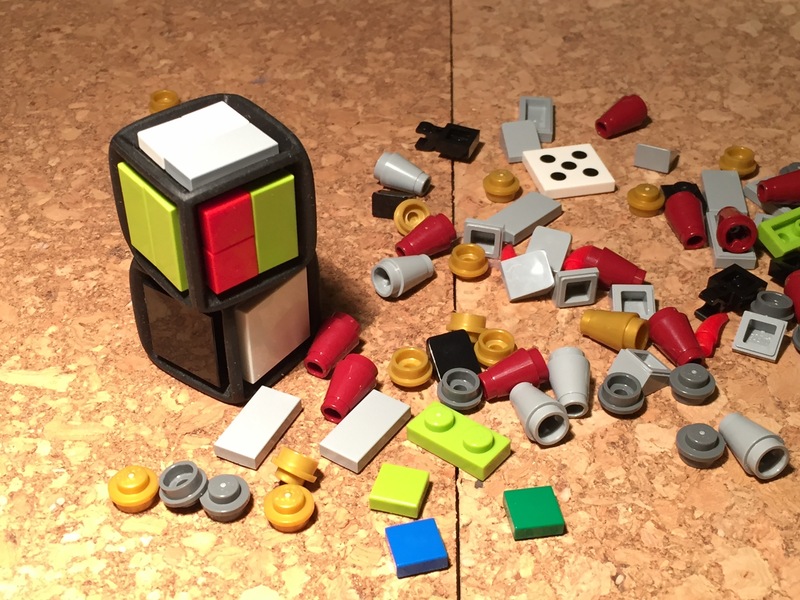 Lego’s bouncy dice are pretty cool, don’t know how fair they are though. But Yea, I;m happy with standard d6’s, the thing they have going is that they are cheep and easy to get. 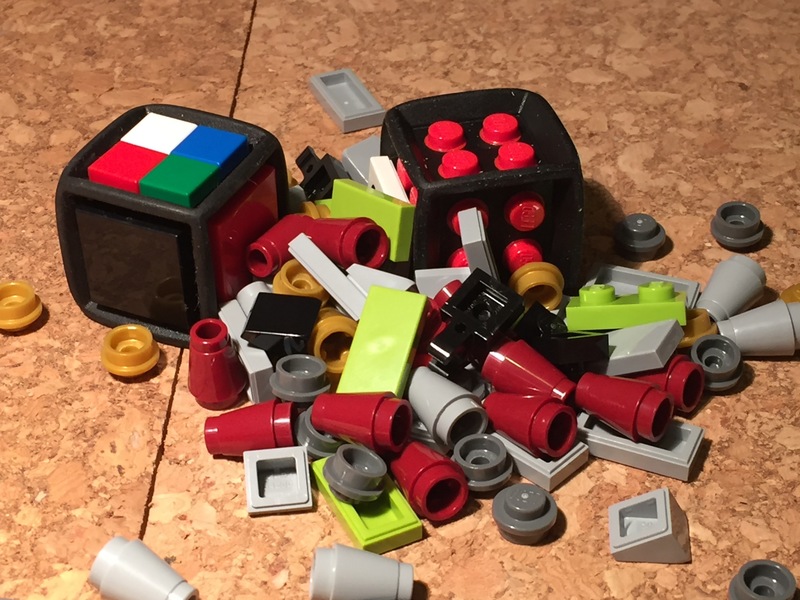 The Lego dice are very bouncy, and yes, I would assume the weight of the pieces on each side would affect probability. My preferred option is also the trusty D6! Me and my players definitely find the 1-6 worst to best results intuitive and easy at the teble. But I’m about to start a campaign game and would consider making or ordering yes/and/no/but dice.